I've heard that the Deka is a good battery. I had a car one in my civic for a long time, and it was a great battery. The A2 has the vent / exhaust / overflow on the oposite side to the B2. 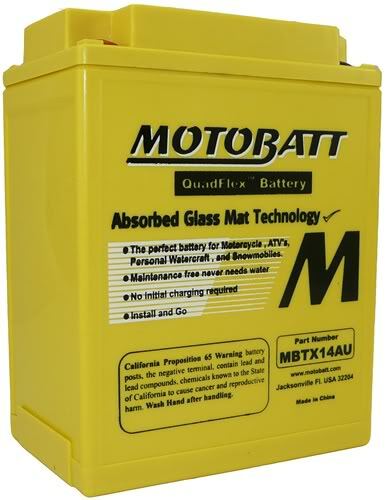 Do away with dripping acid - get a Gel Cell Battery! FYI: I had to twist the Battery Cable Ends to get them to align with the 'L' bracket mounts that are held by screws to the battery posts. I thought this was kinda of cheesy. Last edited by sribop; 05-19-2010 at 02:34 AM. Sribop - Come up to the intro section and say hello and tell us about your bike, and yourself. Sprock is running one now, too. seem to remember who that smart Guy was ! Drag Specialties also makes a version of the YTX14AHL-BS AGM battery. If you have a Parts Unlimited dealer near by then you can probably order one for around $64. Oh, I see how it is, CyberTrip.... the PU AGM you recommend is $64, while the one i recommend is $65.